As the oceans rise, researchers aim to forecast where severe storms will trigger the worst flooding. On 8 September 2017, Thomas Wahl checked in at London’s Gatwick Airport for a nearly-empty flight to Orlando, Florida. A coastal engineer at the University of Central Florida, Wahl knew what was heading for his hometown: category-5 Hurricane Irma, which had already battered much of the Caribbean. He got on the plane anyway. “It was me, the pilot and a few Disney tourists who just didn’t care,” he says. Irma’s heavy rains and powerful winds killed dozens of people across Florida. For Wahl, who rode out the storm in his family’s one-bedroom apartment, the experience was a rare chance to witness first-hand a phenomenon he has long worried about: extreme sea levels — what happens when storm surges, high tides and waves combine. Extreme sea-level events can send water pouring over coastal barriers, swamping people’s homes and drowning crucial infrastructure. They’ve happened, for example, in New Orleans in Louisiana and the surrounding region — still recovering from more than US$100 billion in damages caused by Hurricane Katrina in 2005 — and in Jacksonville, Florida, where Irma swamped parts of the city under 2 metres of water, trapping residents and closing bridges and the city’s international airport. Globally, mean sea level is rising by just over 3 millimetres a year, as glaciers and ice caps melt and warming ocean water expands. Researchers have typically focused on understanding the causes and rate of that rise. But swelling seas are also expected to affect extreme sea levels, with devastating effects. In the coming decades, 100-year floods — those that have a 1% chance of hitting in a given year, or an average return interval of 100 years — could occur as often as every year or two. Across Europe, the cost of coastal flooding could rise by more than a factor of 20 by the year 21001. And in some regions, the intensity of what constitutes a 100-year flood will become much more severe. By combing historical records and using models to estimate the risk2, Wahl and others are making strides in predicting the dangers of such events. The conclusions vary with location. 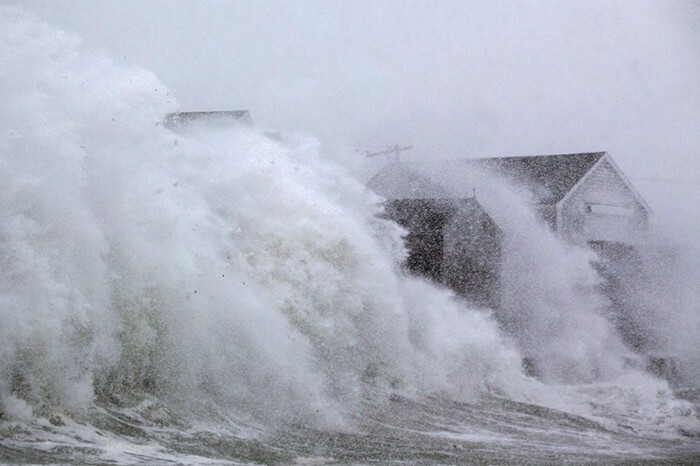 Some coastal communities will face a dangerous rise in the number of extreme sea-level events. Others are likely to be more prone to ‘nuisance’ flooding — inundations that swamp streets and make life difficult for residents but have less-dramatic overall effects. Communities will need such knowledge to help them prepare, says Maya Buchanan, a climate-change specialist at the consulting firm ICF International in New York City. Officials can tackle nuisance flooding by improving drainage and other infrastructure. But extreme events call for bigger efforts: building dykes or beefing up sea walls. All told, some 300 million coastal residents are at risk of these events. “This is important for decision-making and society writ large,” Buchanan says. On 6 February 1978, a blizzard of historic power descended on New England. Heavy snow stranded motorists. High tides combined with storm surge to toss coastal homes around as if they were dolls’ houses. All told, 54 people were killed and thousands of buildings destroyed. The official tide-gauge record from Boston Harbor shows that water levels, not accounting for tides, rose roughly a metre in 12 hours, taking it to one of the highest high-water marks ever recorded there. But it is just one of many records gathered by gauges around the world, which capture the ebb and flow of daily tides, as well as storm-driven surges in water level. In 2009, a team led by Philip Woodworth of the National Oceanography Centre in Liverpool, UK, decided to assemble as many of these records as possible into a custom-built global database. The team focused on measurements that were made at least once an hour, frequently enough to accurately capture the high-water mark during a rapidly changing storm. The database, known as the Global Extreme Sea Level Analysis (GESLA) project, has become the go-to source for analysing how extreme sea levels have changed over time. It shows3 that, since 1970, the magnitude and frequency of extreme sea levels have increased throughout the world. For example, the height of what constitutes a 50-year flood event has risen by more than 10 centimetres per decade in some places4. Most of the blame lies with the rise in mean sea level. As the oceans lap higher and higher against coastlines, incoming storm surges can flood to record high-water marks more easily. One estimate suggests that sea-level rise caused more than $2 billion of the nearly $12 billion in damage done to New York City by Hurricane Sandy in 2012. Other factors also influence extreme sea levels. Long-term atmospheric circulation patterns play a part; a strong El Niño, for instance, pushes water masses around in ways that increase the probability of high sea levels for the US west coast and decrease it for the tropical western Pacific. Changes in the relative height of the land and sea are important, too; much of Scandinavia’s coast has been slowly rising since heavy glaciers disappeared at the end of the last ice age. In southern Asia, the Ganges–Brahmaputra delta is sinking as its sediments compact. GESLA, which was updated in 2016, now contains 1,355 records from around the world, with more than 39,000 station-years (the number of stations multiplied by the length of their records) of data5. Most date from the second half of the twentieth century. But that’s not long enough for researchers who want to improve the long-term statistics. A rule of thumb holds that the frequency of events can be extrapolated up to four times as far into the future as the observational record reaches backward. A few decades of data won’t be sufficient to inform forecasts for a 10,000-year flood event, as is required for some communities and for sensitive infrastructure such as nuclear power plants. Talke and his colleagues have ploughed through reams of handwritten data tables and accompanying notes that describe how the measurements were taken. The notes were crucial to assessing the quality of the data; they describe clocks breaking down, ice-clogged gauges and a drunken observer making questionable measurements. All told, the researchers recovered around 300,000 documents, representing more than 6,500 station-years of lost or forgotten measurements6. In Boston, for instance, they found and digitized 50 years of records from before the 1921 start of the modern NOAA record. From that and even older records they calculated that the sea level in Boston has risen, relative to the land level, by 28 centimetres since the 1820s. With that rise, extremes have become routine: what was a 100-year event in the 1820s is now more like an 8-year event (see ‘The coming floods’). The researchers also discovered extreme events that help put more-modern flooding in perspective. A storm they uncovered in 1909, for instance, turned out to have produced as much flooding as the blizzard of 1978. “The archival research shows that the 1978 event really isn’t that anomalous,” Talke says. Source: T. Wahl et al. Nature Commun. http://dx.doi.org/10.1038/ncomms16075 (2017). But both those high-water marks were exceeded by a ‘bomb cyclone’ in Boston in January, which gained power from rising sea levels to breach sea walls and pour icy waters into neighbourhoods. And last week, another powerful winter storm caused near-record flooding in the Boston area, remarkably just two months after the last record-breaker. Talke shares his findings with other scientists and with officials at agencies such as the Army Corps of Engineers, which is in charge of federal coastal engineering. He hopes that, by understanding the long-term trends, society will be better equipped to make decisions about preparing for future high water levels. Once they have data about past extreme events, researchers have a couple of ways in which they can predict how often extremes will recur. The simplest method is to use something called a Gumbel distribution. This approach was used in the most recent Intergovernmental Panel on Climate Change report on sea-level rise to calculate how often floods would recur under various scenarios of greenhouse-gas emissions. But it is relatively simplistic and does not do a good job of capturing extreme events, Wahl says. For instance, a typical Gumbel analysis might look at the highest annual water level for a given location. That means that only the highest flood counts for a year that might have had more than one big storm. Buchanan and her colleagues recently adopted a different approach, the generalized Pareto distribution, to incorporate all hourly water-level observations above the 99th percentile. That means more data points, and therefore a more accurate picture of the variation over time. The group studied all NOAA tide-gauge records that went back at least 30 years, then combined those data with an analysis of sea-level rise to predict how often floods would occur in different locations, and how large those floods would get7. The bottom line is simple. “Floods are going to become more frequent,” Buchanan says. But the analysis also revealed that the coasts of the contiguous United States will fare differently. In eastern cities such as New York City and Charleston, South Carolina, it is the nuisance flooding that will become more frequent. By contrast, western cities such as Seattle in Washington, and San Diego in California, should expect more-frequent flooding from extreme events. The west generally has steeper coastal slopes, which have tended to protect residents. But rising sea levels are providing oomph to surpass what had once been a protective barrier. The disparity between regions can be stark. If sea level rises by half a metre in Charleston, for instance, today’s 100-year flood could hit 16 times more often. In Seattle, the rate goes up to 335, making it more like a 4-month event. At the University of Chicago in Illinois, oceanographer Sean Vitousek has also been working to understand flood risk, using a statistical technique called a generalized extreme value distribution. In a paper last year in Scientific Reports8, he and his colleagues combined models of global waves, tides and storm surges with sea-level projections to calculate how coastal flooding might increase in the coming decades. They found that a rise in global mean sea level of 10–20 centimetres — which is expected no later than 2050 — would more than double the frequency of extreme sea-level events in the tropics. Hardest-hit will be low-lying Pacific island nations, where sea-level rise accounts for a significant percentage of the variability of typical floods. Places such as Kiribati, the Marshall Islands and the Maldives are not only threatened with being permanently drowned, but are also at risk of regular floods that can ruin water supplies and render land unfit for farming. Predictions of extreme flooding are muddied by uncertainty over how fast greenhouse-gas emissions are likely to rise. In the first-ever projection of how extreme sea levels could affect Europe’s coasts, researchers last year calculated1 that the height of a 100-year flood could increase by between 57 and 81 centimetres by 2100. But that’s an average across all of Europe. In the North Sea region, extreme sea levels could rise by nearly a metre with a high rate of emissions. The Portuguese coast and the Gulf of Cadiz might actually see a decrease in extreme sea levels, thanks in part to a weakening in extreme winds driving storm surges and waves. The team that conducted the analysis, led by Michalis Vousdoukas, an oceanographer at the European Joint Research Centre in Ispra, Italy, has now turned its attention to calculating the economic impacts. Damage from river floods will rise from 0.04% to 0.1% of Europe’s gross domestic product by 2100, Vousdoukas reported last December at a meeting of the American Geophysical Union in New Orleans. But damage from coastal floods, currently at 0.01%, will rise to between 0.29% and 0.86%. “Coastal flooding becomes one of the most important natural hazards in the future,” he said. Vousdoukas and others in this emerging field are keen to bring their discoveries to decision-makers in coastal communities. In Orlando, for instance, Wahl is part of a newly launched effort to bring together engineers, oceanographers, economists, social scientists and other experts. At the new National Center for Integrated Coastal Research, headquartered at the University of Central Florida, they hope to give policymakers the information they need to figure out how high to build defences, such as dykes or sea walls, in the coming decades. Knowing just how bad the situation will be — how extreme the extreme sea levels might get — will be a major part of that effort, Wahl says. “I think we can give advice already, based on what we know,” he says. Vousdoukas, M. I. et al. Earth’s Future 5, 304–323 (2017). Wahl, T. et al. Nature Commun. 8, 16075 (2017). Menéndez, M. & Woodworth, P. L. J. Geophys. Res. 115, C1011 (2010). Intergovernmental Panel on Climate Change. Climate Change 2013: The Physical Science Basis (IPCC, 2013). Woodworth, P. L. et al. Geosci. Data J. 3, 50–59 (2016). Talke, S. A. & Jay, D. A. ‘Archival Water-Level Measurements: Recovering Historical Data to Help Design for the Future.’ In Civil and Environmental Engineering Faculty Publications and Presentations 412 (Portland State Uni. Lib., 2017). Buchanan, M. K., Oppenheimer, M. & Kopp, R. E. Environ. Res. Lett. 12, 064009 (2017). Vitousek, S. et al. Sci. Rep. 7, 1399 (2017).